This month, I had my first visitor to Beijing. My mother-in-law joined me for ten days. Luckily enough, we get on very well, so we had a great time. I prepared a packed itinerary covering her two weekends here, and she was very independent, so she was able to see the best the city has to offer. And she was gracious enough to show an interest in what I am doing in China so joined me for a few events that the UN and others in the diplomatic community were hosting. Though she was quite an important visitor for me, it was impossible to miss that Beijing was also hosting some other important visitors – the Leaders of the Asia Pacific Economic Council (APEC). I say impossible because Beijing made some serious efforts to prepare for their arrival. “APEC Blue” was what all Beijingers were calling the beautiful skies we saw last week, thanks to temporary regulations that cut traffic and shut down factories nearby and closed schools and government offices, combined with the general fact that Beijing winters are fairly dry. 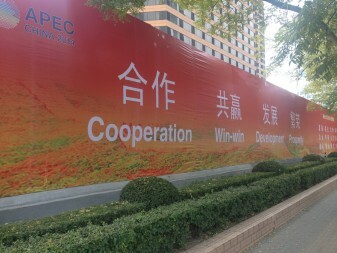 The vendor I often get my fruit from on the street on the way home from work was gone for the week, and bikesheds by the subway were given pretty covers with slogans of “Cooperation, Win-Win, Development and Prosperity”. But while my mother-in-law was visiting for a bit of fun, the APEC Leaders were here for much more serious business. My mother-in-law left Beijing feeling enriched by her new experiences, the APEC leaders left having made new deals that will affect the people in their economies for years to come, such as a new plan for Silk Road infrastructure development. Moreover, they also struck deals that will affect other economies. Notably, the US and China made a deal on climate change, and the US and India prepared a deal on trade that they cinched a day later at the G20 meeting in Australia. While there are varying interpretations of exactly how progressive these deals are (e.g. see this positive view and this more pessimistic view on the climate deal), there is consensus in the international community that climate and trade, for example, are hugely important challenges that not only affect APEC countries but also poorer developing countries all over the world. And the APEC visit helped make progress on them. This kind of action, of using visits of world leaders to make deals and deliver outcomes that not only help China domestically, but actively help other countries is something UNDP China welcomes and works towards. During the APEC visit, I was invited to take part in the opening of a new forum comprised of economic think-tanks from Brazil,Russia, India, China and South Africa (BRICS). At that meeting, I made a call for these think-tanks to not only study the economics of their own regions, but to study how the BRICS, through their meetings and burgeoning institutions like the New Development Bank, can support other poorer countries to rise to the fore as well. The next two years will see even more meetings of global leaders, including many more visits to China, particularly since it has just been confirmed that China will host the G20 Presidency in 2016. I – and my colleagues in UNDP China – will be doing our best to help these leaders not only make “APEC Blue” once again, but “Global Blue” too.